Offering you a complete choice of products which include reflective road delineators, road delineators, traffic delineators and spring posts. 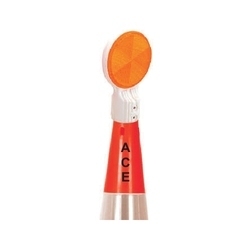 we have been able to procure the best-in-class Reflective Road Delineators for our valued clients. Designed to perfection, these products are in compliance with the defined road safety guidelines. Our esteemed clients can avail from us these products in different specifications and sizes as per their requirement. 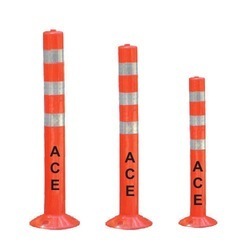 Available in different construction choices, these Road Delineators find use as temporary or permanent traffic safety and are preferred choice for channelizing of traffic through defined/created work zones, parking lots and other similar areas. 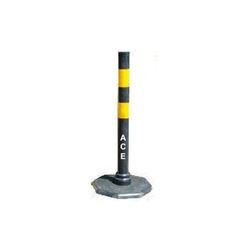 Available in height of 1160 mm, rubber base of 430 mm, bottom weight of 3.5 kg and total weight of around 5.2 kg, these are perfect for use for diverting/guiding vehicular traffic as well as pedestrians. Used in construction/accident prone areas, its high visibility makes it easily and effectively redirecting oncoming traffic. Some of the standard features of product include heavy rubber base with extra grip & stability, use of broad 9" & 9" reflective tape for better and more clearer night visibility and option of interlinking using nylon/plastic chains among others. 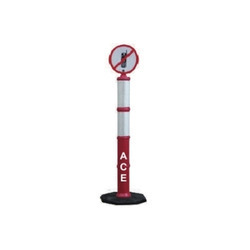 Finding use to delineate/guide traffic in specified/demarcated zones, these Traffic Delineators can be offered by us in different finish sizes, height, color and shape as per the specific requirements of the customers. Here, our expertise lies in making these available in both tubular and flat panel designs which makes thee better option for withstanding of vehicular impact. We offer the delineator in height of 750 mm, rubber base support of 430 mm with weight of 3.5 kg and total weight of around 4.5 kg. For better safety to pedestrians and vehicle drivers, these are also provided with reflective sheeting that can be put on single/both sides. Some of its standard features include 9" & 9" reflective tape for optimum night visibility, higher visibility coverage area in comparison to cones, suitable choice for demarcating traffic flow and option of interlinking it with nylon/plastic chains. Total Weight: 4.5 kg approx. We hold expertise in offering a wide range of Spring Posts options to match up with the specific preferences of the customers. These include Spring Post - 750 (LD), Spring Post - 750(PU) with height of 750 mm, base diameter of 200 mm in single/three moulded construction option. Some of the standard features of these spring posts include strong flexible UV protected PU construction, single piece with no joint, provision of 3 sets of bolts (M12 x 50) at base that allows easy removal without damaging surface of asphalt and multiple reflective band support among others. Some of the application areas these are suitable for include for center lane dividing on narrow roads, for creating multi lanes in broad roads, for demarcating sharp curves, for creating no stop zone at t shape road traffic signals, for parking lots & construction zones, for dangerous medians and u turn and others. 3 sets of bolts (M12 x 50) at base can be removed without damaging the surface of asphalt. Center Lane Dividing for narrow roads. Multi lanes for broad roads. At the start of central verge (where single road becomes double road). No Stop Zone at T Shape road traffic signals. Dangerous medians and U Turn etc.